can you really use these clues alone to tell me their position? 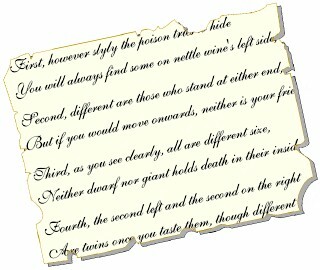 though poisoned wine you'll always find at its right-hand side. two of the three bottles in the middle you will find. death, if you would drink it, would run into your veins. the largest bottle of them all will hold but nettle wine. it was my firm intention to keep it error-free. Jeder Fehler entspricht einem Fehl-Pin: Notiere 10 minus die Zahl der Fehler. Wie viele Flaschen stehen zwischen "dwarf" und "giant"? Notiere diese Zahl!